"Celebrate the upcoming release of the second installment in the compelling Hunger Games film franchise, Catching Fire! 12 all-new hand-painted figures are included in this release. Be sure to promote Catching Fire with this detailed mini figures in your store!" 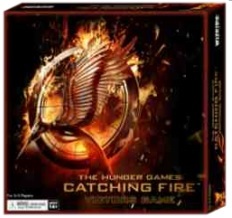 "Each collectible mini figure features detailed sculpts based on the Catching Fire movie! Each hand-painted figure comes on its own pedestal base featuring the character’s District number!" "The fire has started - you and the other rebels are here to see that it keeps burning all the way to the Capitol. Using different card combinations to score points, you must gather the most resources to best aid Katniss and the cause... but watch out! One of the other players may be a Capitol spy who will attempt to steal victory from you! The Catching Fire Victor's Game is an easy-to-learn game of strategy and deduction as players look to maximise the cards that they play while also anticipating the strategies of the other players." Both of these products should be available for purchase by the end of this month. We expect more awesome Catching Fire merchandise details to surface soon, so stay tuned!